In the late Middle Ages there lived in Germany a remarkable scholar reputed to have unraveled Nature’s mysteries and to be able to employ his knowledge in wondrous and magical ways. 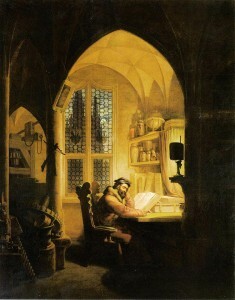 Some regarded him as a skilled alchemist, who had acquired his powers through diligent work: in the laboratory; others said he was only a trickster, who was more a master of sleight-of-hand than of alchemy; but most eventually came to regard him as a conjurer, who had made a pact with the Devil, exchanging his soul in return for knowledge and power. The mysterious scholar was Doctor Johann Faust (c. 1480–c. 1538), and the many legends which grew up about him captured the imaginations of writers, poets, and composers in succeeding generations. Half a century after his death there was published in Germany a book comprising these legends, Historia von Dr. Johann Fausten, by Johann Spiess, which soon appeared also in English and French versions. Late in the 16th century the English playwright Christopher Marlowe wrote his Tragical History of Doctor Faustus based on these legends. After that countless others took up the Faust theme: the theme of man striving to exceed his ordained bounds, seeking knowledge beyond that allotted to others. The most noted writer in this vein was Johann Wolfgang von Goethe, the first part of whose long dramatic poem Faust was published in 1808. Drawing primarily on Goethe’s treatment, Berlioz and Gounod, among others, composed operas. Throughout the 19th century and well into the 20th, symphonies, poems, plays, and novels dealing with the Faust legend continued to appear. The subject evidently resonates with something deep in the European soul. In fact, one may easily see a precursor of the Faust legend in that of Odin, whose quest for truth and understanding led him to give up one of his eyes and to be hanged for nine days from the World Tree. 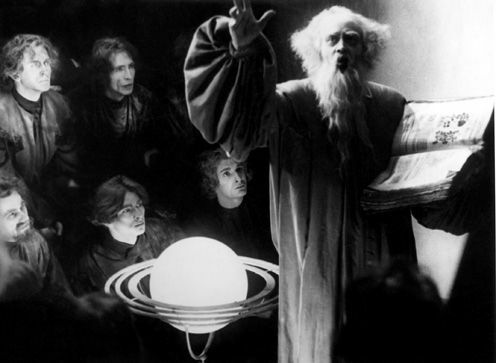 In the many versions of the Faust legend various elements are emphasized, but the persistent theme is that mentioned above: the quest of exceptional men for an understanding of life and Nature: the reaching out for a new level of existence, for a fuller development of latent powers. It is from this persistent theme, rather than from the semi-historical account of the life of Dr. Johann Faust or from anyone of the fictional works using his name that we draw the meaning attached to the adjective “Faustian” today. The word refers to a spiritual tendency in the race which has shown such fascination down through the ages with the idea behind the Faust legend. It describes a fundamental urge or drive latent in the soul of European man—and active in a few exceptional Europeans. It is the source of both our basic restlessness as a race and our basic inquisitiveness. It is what makes adventurers of us, drives us to risk our lives in ventures which can bring us no conceivable material benefit—something which is totally foreign to other races, accustomed to judging everything according to its utility only. It is the Faustian urge which has made our race the pre-eminent race of explorers, which has driven us to scale the highest mountains in lands inhabited by men of other races who have been content to remain always in the valleys. It is what, more than intellect alone, has made us likewise the pre-eminent race of scientists—especially in those days before the practice of science became a well-paid profession. It is what sent us to another world and has us now reaching for the stars. But the Faustian urge is also more than all these things. It raises those imbued with it above the economic men, who, in the eyes of Western politicians and Eastern commissars, of labor bosses and captains of industry, of neo-liberal Democrats and conservative Republicans alike, are the sole denizens of the earth. It makes of man more than a mere consumer or producer. It is, more than anything else, the manifestation of the Divine in man’s soul. But Goethe paints other aspects of his protagonist’s character besides the one we have called “Faustian.” It may be that a better or, at least, less ambiguous—adjective would be “Odyssean” or “Ulyssean,” because the English poet Alfred Tennyson, in one short poem , really strikes closer to the sense of the word that we want to convey than does Goethe or any of the other writers about the Faust legend. And just as Goethe’s Faust is contrasted with his famulus, or student-servant, the pedantic Wagner, even more strongly—and much more concisely—does Tennyson contrast Ulysses with his son Telemachus, a man of “slow prudence . . . centered in the sphere / of common duties,” and quite lacking in his father’s driving spirit. Yet, common usage favors “Faustian” over “Ulyssean,” and we shall be satisfied with it. From a strictly anthropological viewpoint, we may seek a clue to European man’s Faustian tendency in the particulars of his evolutionary development. He was, for 10,000 generations, a hunter of the herds of bison and reindeer and mammoths which roamed the frozen plain of northern Europe during the Ice Ages. We might expect, therefore, that he should show the inquisitiveness he does, which is the mark of the predator, whether cat or man—but we might also ask why other races which went through a hunting phase do not show it to the same degree. We might expect, because our ancestors followed the herds in their seasonal migrations for so many centuries, owning only the property they could carry on their backs, that they should have acquired the restlessness of the wanderer, while more sedentary races should have become, over the eons, more inclined to accumulation and less to exploration. But, again, there have been more southerly nomadic races which seem not to have become imbued with the Faustian spirit. The rigor of the northern climate, the challenge of the ever-changing seasons certainly shaped the character of our race as strongly as any other factor. Aggressiveness, venturesomeness, boldness were traits which enabled our ancestors to find and exploit every scarce possibility for survival in a harsh and unforgiving environment. But the Mongoloid peoples, who evolved in a similarly harsh environment, seem to have responded somewhat differently to it and are today characterized more by stolidity than venturesomeness. We can only conclude that the Faustian spirit is the consequence of a unique and transitory combination of causative factors, to which a single race was exposed over a period just long enough to effect the necessary genetic transformation and give it a tenuous racial basis. Even in our own race it manifests itself strongly only in the few who prefer adventure to advantage, accomplishment to acquisition, self-knowledge to self-satisfaction, the conquest of new worlds to the convenience and safety of the old, a true understanding of the Absolute to the unquestionability of a narrow orthodoxy. The race which is the bearer of this spirit must, therefore, be doubly careful that its genetic basis is preserved—that it does not become a race solely of lawyers, clerks, laborers, and merchants but remains a race also of philosophers, explorers, poets, and inventors: of seekers of ultimate knowledge, of strivers toward the perfection which is Godhood. When we take the longest viewpoint, we can see that the Faustian spirit, tenuous though it may be, is European man’s entire justification for existence. Source: National Vanguard, no. 65, 1978; reprinted in The Best of Attack! and National Vanguard Tabloid, ed. Kevin Alfred Strom (Arlington, Va.: National Vanguard Books, 1984), p. 145.